On these pages you will find information about my work as a writer of fiction and non-fiction, plays, poetry and journalism. You will also find details of the creative writing courses I teach, and other events. I am available for commissions, including reviews, reports, opinion pieces, interviews and short fiction for themed anthologies. 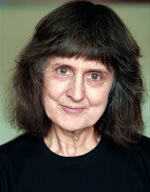 Click here for Zoë Fairbairns on the British Council Contemporary Authors website. Click here for Elaine Aldred’s interview with Zoe Fairbairns. Click here here for Zoë Fairbairns in Writers In Conversation.